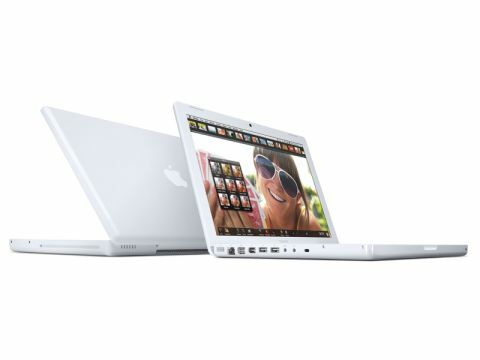 This mid-2009 version of Apple's 13.3-inch polycarbonate-bodied MacBook offers an incremental upgrade for the shiny notebook we've known and loved since May 2006. It might not be streets ahead of the revision released in January, but it's another step forward for a machine that's come on a long way in the last three years. But what does this new revision offer over its predecessor? Unsurprisingly, its Intel Core 2 Duo processor has been upgraded, from 2.0GHz to 2.13GHz. This speed boost is reflected in our Xbench CPU benchmarking test, where it scored 118.98 against its predecessor's 91. Not an increase that will set the world alight, but a significant step forwards. The MacBook's onboard RAM has been beefed up too. You still get 2GB, but it's now 800MHz, up from 667MHz. Hard drive capacity has also increased from 120GB to 160GB. The frontside bus speed remains the same at 1066MHz, as does the graphics processor, an nVidia GeForce 9400M using 256MB RAM, shared with the main memory. Its AirPort, optical drive and overall weight remain the same too. As you'd expect from an Apple laptop, the glossy TFT screen is gorgeous. Unfortunately, it's not the same one they're utilising in the 13-inch MacBook Pro, with the 60% increase in colour gamut, but even so, it's very impressive. With a 1280x800-pixel resolution, widescreen format and great viewing angles, it's perfect for all your multimedia viewing as well as surfing the web and general computerorientated uses. Something we're glad hasn't been changed is the expansion ports. With its removal from the October 2008 release of the 13-inch aluminium MacBook and the iPods moving to USB for charging, the future seemed bleak for the FireWire format. But it seems reports of its death were greatly exaggerated. This model still has a FireWire 400 port alongside a pair of USB 2.0s, a move that will be welcomed by those who still own FireWire peripherals. A surprising improvement is the beefed-up SATA interface, which connects the computer to the hard drive. It's now SATA II. As mentioned over the page, you won't notice the extra turn of speed unless you replace your HDD with a good-quality solid-state drive, but it's an improvement nonetheless. With the component upgrade, the white polycarbonate MacBook outperformed the newly discontinued entry-level aluminium unibody MacBook (see the benchmark table on page 81). Naturally, this situation was never going to last. Not long after its release, the 13-inch unibody MacBook joined the MacBook Pro range, and also enjoyed across-theboard component upgrades.